“The Philokalia” is a collection of texts on prayer and the spiritual life, written between the fourth and fifteenth centuries by spiritual masters of the Orthodox Christian tradition. First published in Greek in 1782, translated into Slavonic and later into Russian, “The Philokalia has had a decisive influence upon the Orthodox Church during the last two centuries, and it continues to be read more and more widely. 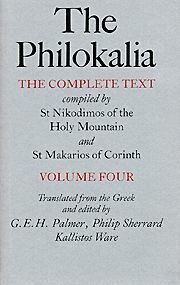 “The Philokalia” is devoted to themes of universal significance: how we may develop our inner powers and awake from illusion; how we may overcome fragmentation and achieve wholeness; how we may attain contemplative stillness and union with God. The Fourth volume contains some of the most important writings in the entire collection. St. Symeon the New Theologian speaks about the conscious experience of the Holy Spirit and about the vision of the divine and uncreated Light. St. Gregory of Sinai provides practical guidance concerning the life of the Hesychast and the use of the Jesus Prayer. St. Gregory Palamas, in a difficult but deeply rewarding text, discusses the distinction – often misunderstood – between the essence and the energies of God. Includes introductory notes to each of the writers, a glossary of key terms, and a detailed index. Softbound. 458 pp.